The FTSE ended 0.26% higher on Friday as markets switch to a risk on mood following China’s upbeat economic data and optimism surrounding earnings season on Wall Street. In the UK, Brexit is on pause and the only progress that has been made is that with regards to the deadline that is now extended to October 31st. The lingering uncertainty on domestic grounds leaves the appeal on UK assets low and the bulls are challenged to break this month’s high at 11470 with improving global data and Wall Street’s earnings reports holding a strong influence on market sentiment. The FTSE has managed to drift higher since touching on the support at 7380 last week and ended at 7347 on Friday. The bulls have yet to overcome this month’s high at 7470 alongside the trend line resistance from May to clear the path for further gains on the FTSE. 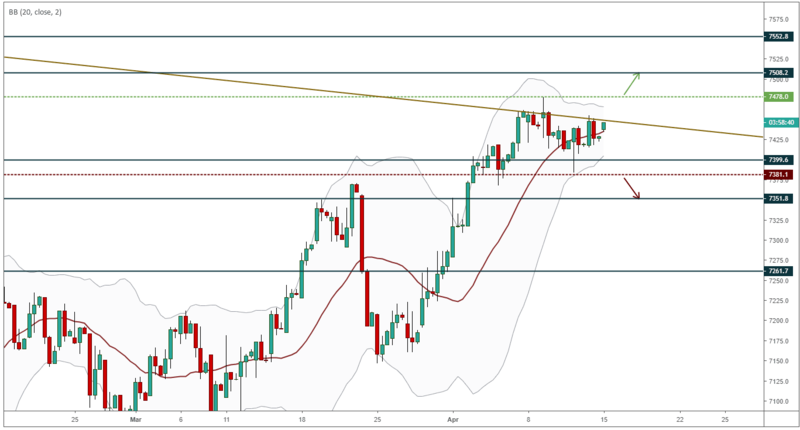 The bullish view persists so long as price holds above the support at 7380 and buying pressure remains intact above the 7400 level.